Impingement or pinching of the hip joint is a condition that mainly occurs in young, active people. This condition is also called femoroacetabular impingement or FAI. 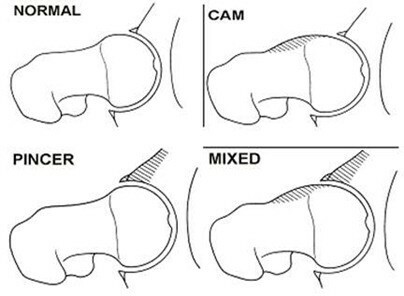 FAI occurs in sports that require deep flexion of the hip. In other words in which the upper leg has to be raised up high. This produces a conflict between the neck of the femur and the acetabulum. The most common sports in which FAI occurs are football, volleyball, ballet, hockey, karting and combat sports, etc. A differentiation is made between a defect at the level of the pelvis with too much bone overhang at the top part of the acetabulum. This is the ‘pincer’ type. Extra bone may also have formed at the level of the neck of the femur, which is called the ‘cam’ type. Lastly, both can also occur as a combination, ‘mixed’ type. Deep bending produces a conflict that results in tears in the labrum and damage to the cartilage. The end result of this condition is osteoarthritis of the hip joint. This leads to pain in the groin during sudden movements or when working out. A click can be felt in the groin in rare cases. This causes the joint to stiffen and when the pain flares up a limp may be noticeable. Your doctor will conduct a thorough examination and try and reproduce your discomfort using specific movements. X-rays and an MR examination are often necessary to confirm the diagnosis. Femoroacetabular impingement is first treated conservatively with anti-inflammatory (NSAID) medication and physiotherapy. If the complaints are only provoked by very specific movements, avoiding the latter may suffice. If there is any doubt the next step involves an intra-articular infiltration, which means injecting an anaesthetic into the hip joint. 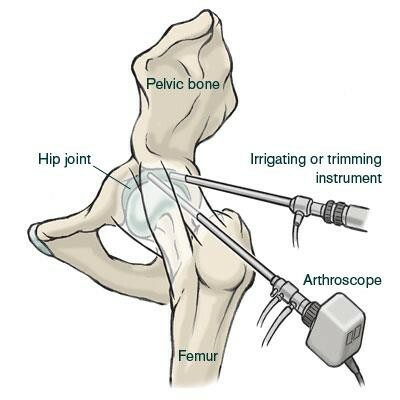 If this produces a favourable result, it has been demonstrated that the pain is caused by a conflict in the hip joint and in this case (keyhole) surgery on the hip is recommended. During the operation the excess bone is removed, the labrum is repaired or the detached fragments are removed if it cannot be repaired. If the damage to the cartilage is too pronounced, the operations described above are of no use and treatment for osteoarthritis is required. 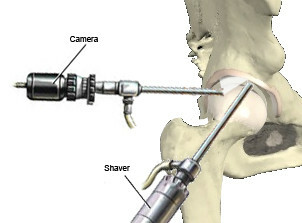 A hip arthroscopy or keyhole surgery on the hip joint is an operation during which a camera is inserted through a small incision in the upper leg and instruments can be inserted in the hip joint. This operation can be used to treat hip joint disorders that are characterised by no case or only a very minor case of osteoarthritis. The most common indications are femoroacetabular impingement, injuries of the labrum, loose bodies (loose pieces of cartilage in the joint), snapping hip and irritation of the iliopsoas tendon following a total hip replacement. Although this procedure has existed for a number of years, over the past ten years there has been an increase in the amount of scientific research conducted into the different possibilities offered by this operating technique, which means it could be applied to treat new conditions. Since the hip joint is found deep inside the body this operation requires more time and rehabilitation than keyhole surgery of the knee or shoulder joint. For this operation the patient is placed on a traction table to create space in the hip joint so that the cartilage is not damaged by the instruments. The correct position of the instruments is verified using X-rays. Following this procedure, in most cases rehabilitation consists of keeping the weight off the operated joint using crutches for a couple of weeks. Muscle-strengthening exercises can begin once full mobility has been regained. The programme can be tailored to your specific condition and treatment.